Toast the End of Summer with Arbor Mist Frozen Wine Cocktails! Summer is unofficially over today, but your summer parties, pool parties, and grill outs don't have to! 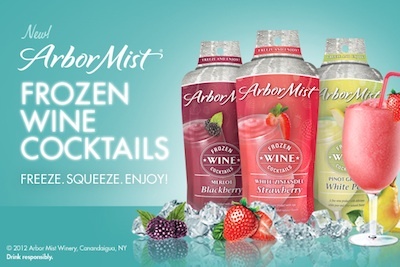 There is still a lot of nice weather, sun, and fun to come and make sure when you are having that end of summer, back to school fun, you have the new Arbor Mist Frozen Wine Cocktails near by for a sweet frozen wine drink to cool you down and quench your thirst! I recently received two of each of the great flavors of Arbor Mist Frozen Wine: Blackberry Merlot, Strawberry White Zinfandel, and White Pear Pinot Grigio. Arbor Mist Frozen Wine Cocktails are a new way to enjoy great-tasting wine with a splash of fruit, frozen! The best part about them is that they are so easy to drink frozen: you just simply freeze, squeeze and enjoy! Arbor Mist Frozen Wine Cocktails require no mixing of ingredients, ice or blenders. Simply place the liquid pouch in the freezer for five hours, gently massage, tear open the top, squeeze to pour into a glass and enjoy a smooth frozen wine cocktail with all the great taste and same alcohol level as Arbor Mist Wines. All the flavors were super sweet and my throat actually kind of hurt after one glass. That's when I noticed that these drinks contain high fructose corn syrup (which I try to avoid if I can) and 44g of sugar! There are just a lot of other wines and spirits I can drink and serve that don't contain high fructose corn syrup and that much sugar and still taste great...so that really dampened my impression of these Arbor Mist Frozen Wine Cocktails! But if you like a really sugary, fruity wine that is easy to freeze, pour and serve, then you will really like frozen wine cocktails from Arbor Mist. The flavors are really fruity and they taste heavenly on a hot day! Buy It: You can purchase the Arbor Mist Frozen Wine Cocktails at local retailers.